Perhaps a little early, I just received, an invitation to buy christmas cards from Jacari. 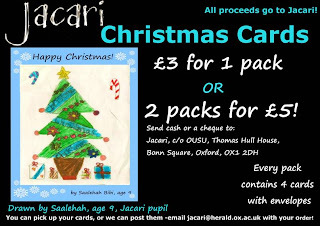 "Jacari is a student-run charity providing home teaching for children living in Oxford. These children, who are between 4 and 16 years old, do not speak English as their first language and often come from refugee families and those seeking asylum. University students volunteer to help improve their allotted child's English and performance in other subjects as required." I spent an hour a week for about 3 months reading with a kid and helping him with his maths homework. The improvement in his ability and enthusiasm for reading was noticeable every week. Fantastic organisation. I am amazed that it hasn't been scaled up. The government should mandate this for all university students who want any kind of government subsidy.